Today we celebrate the world’s favorite bear: Winnie the Pooh! January 18th is National Winnie the Pooh day, and with that silly old bear on my mind, it got me thinking about the rumbly in my tumbly! Time for something sweet: Winnie the Pooh Honey Pancakes! I made a whole wheat version of pancakes, that are only sweetened using Pooh bear’s favorite food – honey! Step 1. Beat your almond milk, coconut oil, eggs, honey, and vanilla together. I suggest that before you measure the honey, to spray your measuring cup with coconut oil. That way, the honey just slides right out of your measuring cup. Step 2. In a seperate bowl, mix your cinnamon, salt, baking powder, and flour together. Step 3. Combine your wet and dry ingredients, and mix well. Step 4. Cook on the stovetop until lightly golden brown on each side. If you want to make your pancakes Pooh shaped like I did, it’s simple! Think almost like making a Mickey shape, but instead of three circles it’s three ovals. The batter is thick, which makes it each to shape your pancakes. Step 5. If you want to make your pancakes look even more like Pooh bear, you can do what I did and line the bottom with raspberries or strawberries to look like Winnie the Pooh’s red shirt, top his ears with banana slices, use chocolate or carob chips for his eyes and nose, and instead of topping with maple syrup, top with HONEY! 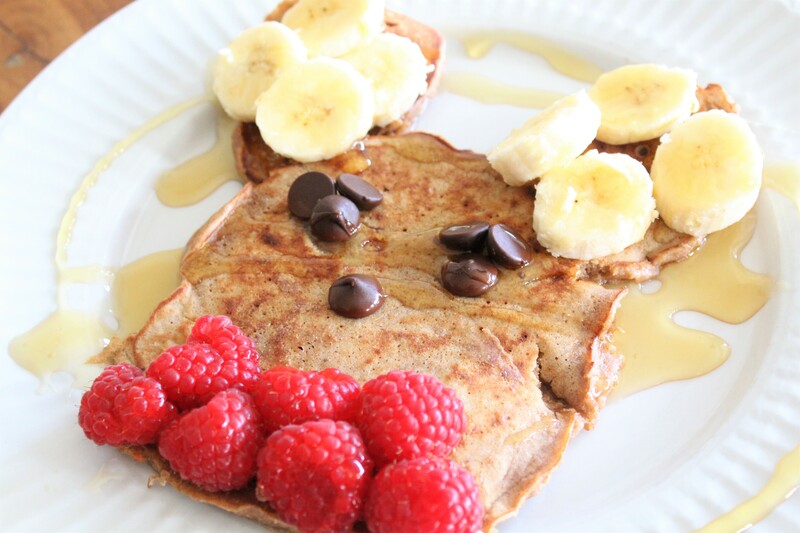 Enjoy these Winnie the Pooh Honey Pancakes! I hope your Winnie the Pooh day is filled with honey!